Fangirl tells the story of twin sisters Cath and Wren from the start of their freshman year in college. Even though they are going to attend the same school, Wren unexpectedly decides not to room with Cath, throwing her sister for a loop. Wren, it seems, wants to break out and make a life of her own without her sister. Wren is the outgoing one, easily fitting in at college and making new friends. Cath is painfully introverted, crippled with social anxiety that, among other things, drives her to eat protein bars in her room instead of going to the cafeteria because there are too many people and too many social pitfalls waiting for her there. Cath is too much in her own head, worrying about potential disasters and clinging to her only comfort zone – the world of Simon Snow fandom. Cath, it seems, spends most of her free time writing Simon Snow fan fiction, but she’s not just any fan writer. In fact, she’s one of the most popular writers in the entire fandom, and she’s best known for her slash depicting a romantic relationship between Snow and his roommate/nemesis, Baz. Cath and Wren started out writing together, but as they got older, Wren stopped collaborating with her sister even as Cath’s star rose in the fan writer community. As the book opens, Cath is deep in the middle of writing her own alternate version of the upcoming eighth and final Simon Snow book. Cath loves writing about Simon and Baz, loves writing so much that she signs up for a fiction writing class normally reserved for upperclassmen. Anyone who has ever attended a college fiction course can guess what kind of disaster is heading Cath’s way, so deep is she embedded in the world of fan fiction. That said, Fangirl is a thoroughly even-handed depiction of fan writing; Cath clearly writes her Simon Snow stories as an escape from the real world, but it’s also apparent that her prolificacy and storytelling skills only improve thanks to her constant remixing of the Simon Snow universe. Fangirl doesn’t condemn fan fiction, but does point to it as a stepping stone towards learning how to tell your own stories. At its heart, though, Fangirl is a character study of a girl who I’m sure many socially awkward readers can recognize and identify with. As we slowly learn more about Cath’s relationship with her family members – her bipolar dad, her absentee mother, and her suddenly distant twin – she becomes a fuller and even more powerful character. At first her fears seemed outrageous even as I could imagine myself inside the same kind of toxic mindset; once I came to understand where Cath was coming from, however, the book packed a palpable emotional punch. Her coming of age over the course of her freshman year is both realistic and stirring. I also loved Fangirl’s depiction of Cath’s burgeoning romantic relationship. The love scenes are tentative and believable, and felt so true to life. Cath’s growth as a person depends on her learning to open up and trust others after experiencing so much heartbreak at a young age. 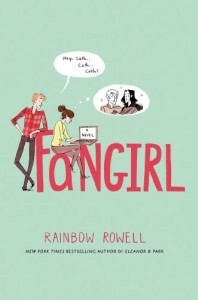 Where so many young adult novels seem to include romance by default, Fangirl makes the romantic storyline crucial to Cath’s development, and the difference is incredibly refreshing. The highest compliment I can pay this book is that once I sat down and truly devoted myself to reading it, I didn’t stop until I had thoroughly blown past my bedtime by several hours. My sleep schedule is still recovering, but I don’t regret a minute. Rowell is definitely an author to watch.